As fans know, pound-for-pound king Vasyl Lomachenko has, during his career, been forced to take some time out of the ring due to an injured shoulder, and there are reports surfacing that say the lightweight champ suffered another injury in last night’s brutally commanding KO win over Anthony Crolla: that of a broken right hand. 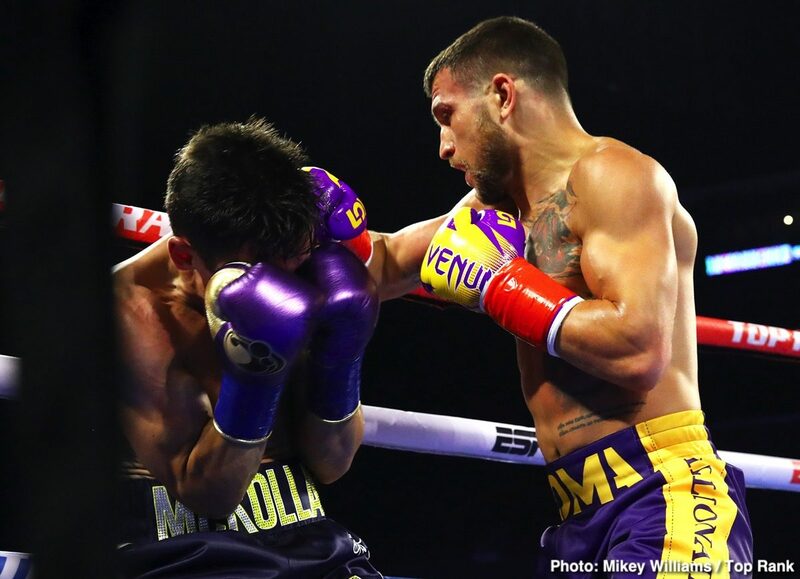 A victorious Lomachenko spoke with ESNews after picking up his 13th pro win, and he said that he hurt the hand with the very last punch he threw in the fight: that sizzling right hand that ruined the brave but outgunned Crolla. It would be a shame if 31 year old Lomachenko was forced to endure another layoff due to the hand (he was only able to box twice last year, due to the shoulder injury that needed major surgery; Lomachenko having wanted to fight three times in 2018), but of course it may be unavoidable. Lomachenko punches hard and accurately and the human hand and it’s complex series of bones cannot always take the strain. If he has to rest up and heal for the six to eight weeks he spoke of, this could mean that Lomachenko would not be able to fight again until August or September time, maybe even later in the year. This would be frustrating – for Lomachenko himself and for his millions of fans. It is perhaps worrying that, after just 14 pro fights (of course Loma had getting on for an amazing 400 amateur fights) Lomachenko has suffered two major injuries (of course we must wait and see how bad the hand injury is). Is the body of the 31 year old breaking down? Let’s hope not. For injuries aside, Lomachenko looks every bit an unbeatable fighter. Previous boxing news: James Toney At His Best – As A Cruiserweight?